Want some news about LG’s new Android tablet powerhouse? Last we heard from the Korean tech giant LG, it was scrapping plans for Froyo and looking forward to a more suitable version of Android for their tablets, which a senior official at the company has today clarified to mean Honeycomb, describing it as the “tablet PC-version” of the OS. LG plans right now are to release the 8.9-inch LG Pad in the first quarter of 2011, boasting that it’ll come with a dual-core Tegra 2 chip inside — the release window is said to be for both domestic and overseas markets. LG has not given any official statement about the devices. Which is interesting. It seems whoever the cited official in this piece, he was dishing details that LG doesn’t want the world to know yet. LG’s PR team has also pulled a tweet about this story, with no statement as to why. 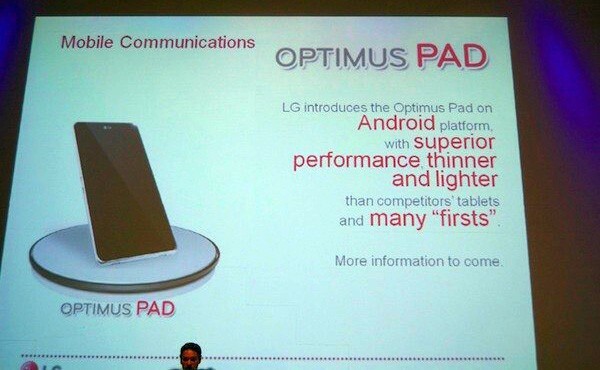 We also know of the other LG Optimus Android Tablets/Slates, the Optimus One and the Optimus Chic . Both of them feature the Android 2.2 Froyo operating system, and probably will reach worldwide. The Optimus Chic is targeted at young customers, but the Optimus One is an entry-level device. If LG is waiting for the newest version of the Android OS for their premium tablet and it’s not Android 2.2 aka “froyo”. So it is possible that Honeycomb may launch during the 1st/2nd quarter of next year.